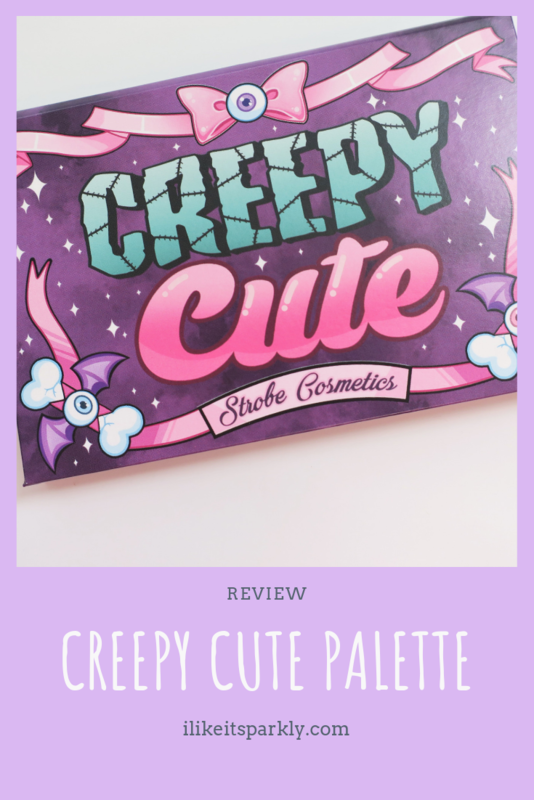 This one is all about the Strobe Cosmetics Creepy Cute Eyeshadow Palette, which retails for $35.00 and comes with 0.423oz total, so this eyeshadow costs roughly $82.75 per oz. As far as I know, this palette can only be purchased through the Strobe Cosmetics website. Let’s start this review out the way that I start pretty much all review and that is by talking about the packaging of this palette. This palette feels pretty typical for an eyeshadow palette, it isn’t too heavy nor does it feel cheap. It does feel pretty sturdy but it is still a cardboard palette. 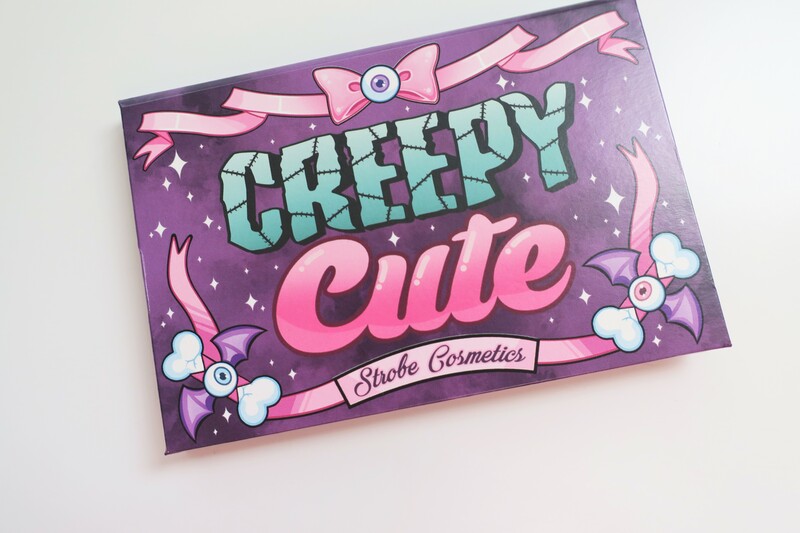 I like the look of this palette, it makes a lot of sense with the theming of it, it is both cute and creepy, I must admit that I think it leans towards the cuter side of things but still very much both. I like the inside, it’s very bland but the layout is nice and I have zero problems with the way the shades are in the layout. While we are on the subject of shades, let me talk about that for a minute, the only thing that really bothers me about this palette is the black and gray shade, they just feel really random and I feel like one of these could have easily been replaced for a pastel yellow, which is a shade that I think this palette is missing. Not that big of a deal, I just would have preferred a yellow over a black as the black looks really out of place to me. Let’s chat a little bit about teach shade, starting with Tombstone which is a matte gray shade that feels like the exact perfect gray tone to me. 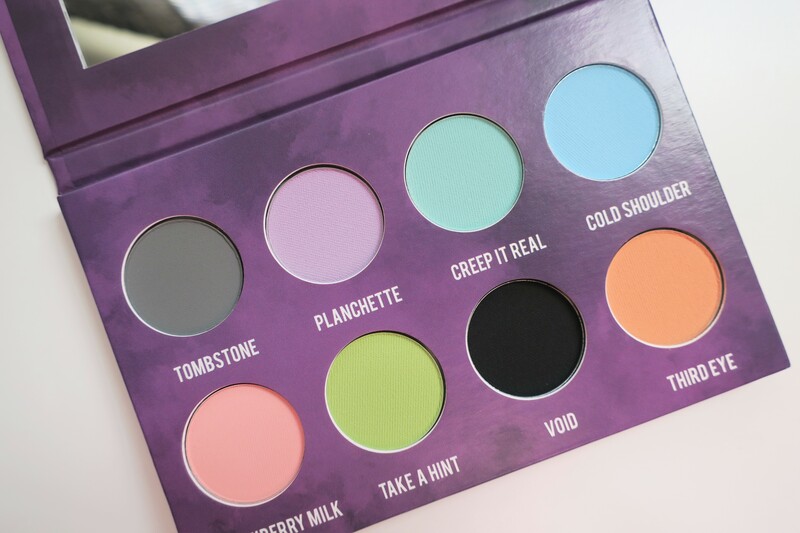 Planchette is a matte lavender shade that is probably one of the sheerer shades in this palette but can be built up really well. Creep It Real is a stunning matte mint kind of shade that is perfect, it’s everything I’ve ever wanted in a pastel minty shade. Cold Shoulder is the pastel blue in the palette which really reminds me of the sky, it’s the perfect sky blue and I love it. Strawberry Milk has my favorite name for sure, this is a really pretty matte pink that is for sure the sheered of all though I think it can be built up really well. Take a Hint is a really fun spring green, it just reminds me of spring and is really pretty. Void is a really fantastically dark black matte shade, it’s seriously so good and dark. Third Eye Is our last shade and is a peach kind of shade. 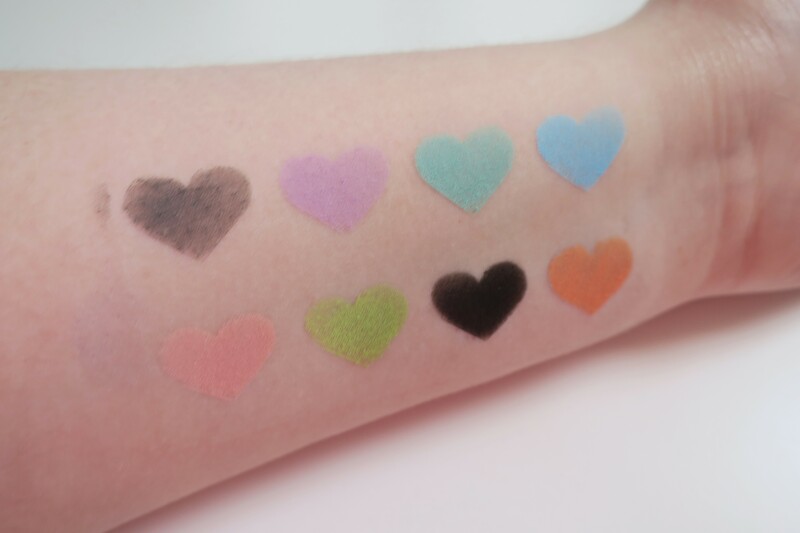 I was so impressed with this formula, all of these shades are so pigmented, even the ones that are a little bit more on the sheer side go on really well over a little bit of primer. I found it super easy to get fully opaque colors with very little effort, which is impressive regularly but more so since these are pastels and pastels aren’t known for being the brightest shades always. These also blend really easily, they are soft shadows but they do not kick up that much powder. The formula of these eyeshadows are truly impressive and some of the best that I have ever tried. I think by now you can tell that I really loved this palette, I would have liked it better if there had been yellow and maybe another pastel color instead of gray and black, just because I think it would be more cohesive and make looks within this palette a little bit easier, but I am still really happy with this palette. So, if you are looking for a pastel palette or just some fun colors, I would for sure recommend this one because it has some of the best fun colors that I have ever tried. What is your favorite bright colored palette?